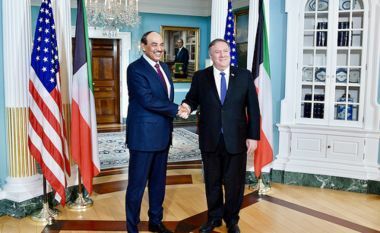 WASHINGTON-- Kuwait's Deputy Prime Minister and Foreign Minister Sheikh Sabah Al-Khaled Al-Hamad Al-Sabah, leading a senior-level delegation on an official visit to Washington, held talks with US Secretary of State Mike Pompeo on Thursday. Both sides discussed the strategic partnership between Kuwait and the United States, as well as ways to promote the close relationship and open new horizons for cooperation in all fields. They also dealt with regional and international issues of common concern. The meeting gathered also Kuwait Ambassador to the US Sheikh Salem Abdullah Al-Jaber Al-Sabah and Assistant Foreign Minister Sheikh Dr. Ahmad Nasser Al-Mohammad Al-Sabah.